BBB then Fulgaris started reviewing their UI for functionality. BBB is a clicker, Ful is a button masher. Me? Well I don't know, both(?) Since, I haven't really reviewed my recent UI changes since last year, I thought I'd also contribute. 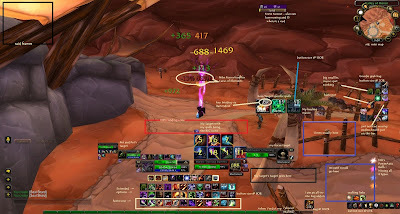 Here's is my raiding UI! Minimize my eye movement on screen. I read a forum post reviewing eye focus. It stated that it typically takes 0.2 to 0.5 seconds for your eye to focus on something different. (to find at button, click, then refocus could take 1.5 seconds) To minimize my eye movement, I've placed myself and my target immediately at my feet. (Stay out of that green gooey stuff). Spell timers are immediately visible on my target. Remove clutter. I removed Necrosis as it's functionality wasn't adding anything to me. I removed all additional bag buttons as I only needed to click one to see contents. One version, I was having a button bar disappear when in combat (like micro and crafting bar), but it became too complicated. I am right-handed. This means (to me) that I favor looking right for info that left. I typically notice changes on my right, before my left (raid chat window). Omen, Recount land here. I allow them to overlap with some buttons when I don't need them (especially crafting, micro menu, world map). Make use of audio and visual cues. Omen plays Taiko drums when I get close to stealing aggro. Forte plays ding when SS expires. PowerAuras provide visual queues when personal and target's buffs drop. DBM provides it's own alerts (center screen). Button mash my spell rotation 1 - 5, sometimes 6,1,2,3.... I flip CoA and CoE around depending on the fight. I always want 5 big icons to show up on my target..
Click everything else depending on need, i.e. Curse of Tongues on the mages in Valithra, or Shadow Ward in Festergut. Constantly re-purpose big buttons. Assigned mouse-button #4 and 5 (via Bartender) to the large buttons center screen. I typically use these buttons for dropping in macros. Marrowgar I have a target bone spike macro. Festergut I drop the portal, in case I am #2 with spore at casting range. I like to have my emergency heal button up at all times (just in case). I pasted several macros at end of this post. Decrease screen-estate used. Macros to minimize number of buttons displayed. Shrunk my non-critical buttons as much as my quad-shot-espresso-driven jitters would allow. Recount, the ego checker, is often not displayed, but if it is, sometimes I put on top of the world-map. Mouse turn, keyboard strafe. I try not to use my right hand for anything other than mousing. 85% of what I do, I don't have to move my left hand at all. Only when, say I want to Drain Soul, do I need to. I hope this is helpful for you. Unlike my PVP UI, which is still a mess, I am comfortable with this interface. I can quickly find most all that I need. Running Beta, my biggest problems so far, is the portraits being way up in the right hand corner. It is the greatest thing impacting my game play. Hopefully when add-ons are turned on in Beta, I'll find all of the big-deal add-ons below work seamlessly. Until then, have fun! 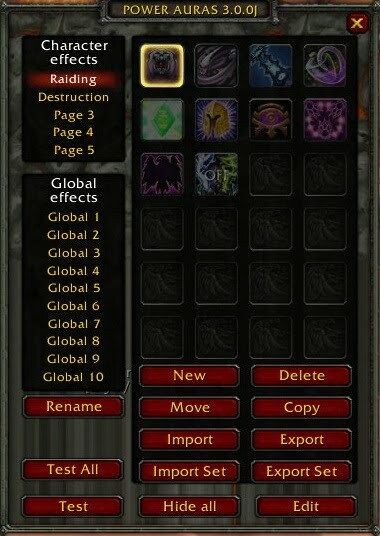 If you Read More, below I've posted the add-ons displayed here, the macros I like using and my raiding PowerAuras set. 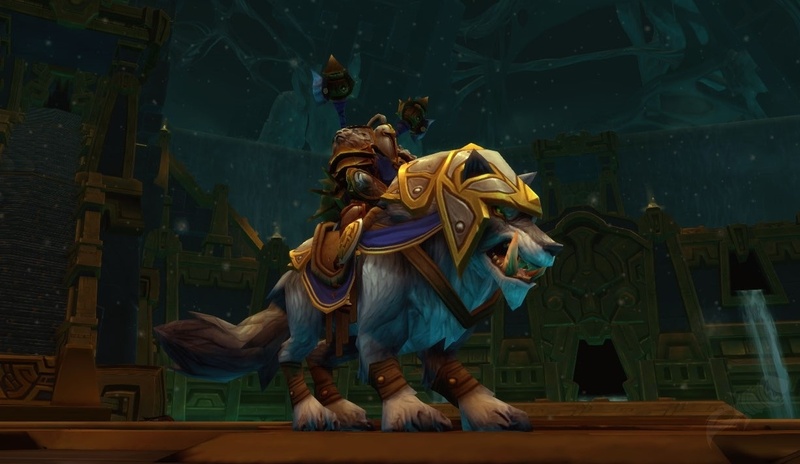 Random Mount - one button summon land or flying mount depending on location. Add-on Control Panel - allow for various profiles of different add-ons. 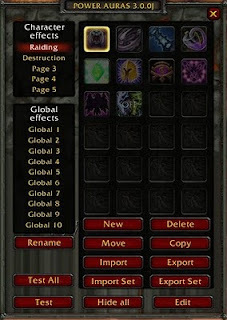 Easily switch to profile for running AH addons (see Gold post), or questing (includes Carbonite). 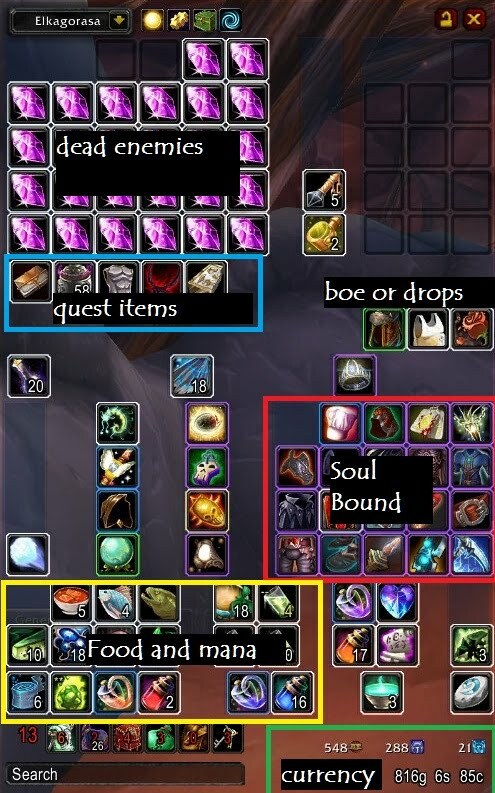 T-Bag Sefki - all-in-one bag addon, provides sorted, searchable view of all my bags. I am considering hiding the soul-shard bag as I don't use this for a shard count any longer, reference Stones macro (see below). Wowhead looter - since I use that site SO much for this blog, figured I'd give back. Outfitter - haven't tried the in-game wardrobe thingy as I've had really good luck with this addon. I especially love running into Argent tourney grounds and having it auto-equip the lance when I am standing near a tourney mount. Macro: Orc Curse - uses Orc racial as a spell power boost. PowerAuras - Try copying all of the following code, and doing an Import Set. Code consists of 8 different auras. As long as it works I suppose, but seeing half the screen unused makes me sad panda ^^ Perhaps that would be just the right place for something like Recount, since you don't really need to look at that during fights anyway? Recount has a spot on that screen. It typically sits in the bottom right corner over my bags, or over the world map in the top right.